Radio and TV channels, mobile communications, GPS, and emergency communications are just a few examples of applications that occupy the airwaves. The radio spectrum is a finite resource, but demand for bandwidth is accelerating. As a result, the telecommunications industry is facing what the U.S. Federal Communications Commission (FCC) calls "the impending spectrum crunch." In Microsoft Research's Mobility and Networking Research Group, senior researcher Ranveer Chandra has been co-leading the Networking Over White Spaces(KNOWS) project, which explores the use of spectral "white spaces." "Even when a specific chunk of spectrum has been allocated to a specific user, it turns out that, quite often, large portions of that spectrum are unused," says Chandra, the latest focus of Channel 9's Microsoft Research Luminaries video series. "These empty fragments of spectrum scattered between used frequencies are known as 'white spaces.' The problem we are trying to solve is: How can you take advantage of white spaces while avoiding interference with the frequency's primary user?" 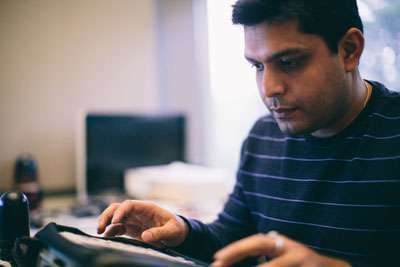 In 2009, Chandra co-authored White Spaces Networking with Wi-Fi like Connectivity with KNOWS colleagues Victor Bahl and Thomas Moscibroda, along with Rohan Murty and Matt Welsh from Harvard University. The paper presents the design and implementation of WhiteFi, the ﬁrst Wi-Fi-like system constructed atop white spaces in ultrahigh frequencies. The WhiteFi protocol determines the available white spaces at that location and transmits on those frequencies. Since the FCC strictly forbids interference with primary users on a channel, the team had to make a performance tradeoff between using a wider bandwidth and avoiding interference with adjacent frequencies. The researchers achieved this using a time-domain radio-frequency signature approach called Signal Interpretation before the Fourier Transform to differentiate primary users from other white-space interferers. Furthermore, they implemented WhiteFi with a backup channel so that if a primary user is detected, the wireless device or access point switches immediately to the backup channel, which then reassigns transmission to another white-space frequency. A protocol, however, represents just one component of a complex telecommunications infrastructure. The team had to modify wireless devices, antennae, routers, base stations, and operating-system software to support WhiteFi and to interoperate with existing infrastructures. White-spaces projects also require consensus from policymakers, such as the FCC. "Fortunately, we had published our findings along the way," Chandra says, "which made it a lot easier when it came time to demo to FCC officials. We had credibility, because our papers were peer-reviewed and we had strong collaboration with the academic community." The FCC issued an experimental license in July 2009 for WhiteFi to operate inside Microsoft's Redmond campus, an area of about a square mile. A few months later, in October 2009, Chandra and his colleagues deployed the world's first operational white-spaces network. "We installed a white-spaces radio in one of the campus shuttle buses," Chandra explains. "The radio communicates with two base stations on campus. It also bridges between white spaces and Wi-Fi, so that shuttle passengers can connect their devices to the corporate network using standard Wi-Fi protocols." Wi-Fi signals fade after about 100 meters from a base station, while those of UHF cover ranges measured in kilometers. Before the campus deployment, Chandra and his colleagues weren't sure what sort of range to expect from WhiteFi. Although they were taking advantage of UHF, they also were using a new set of mechanisms. 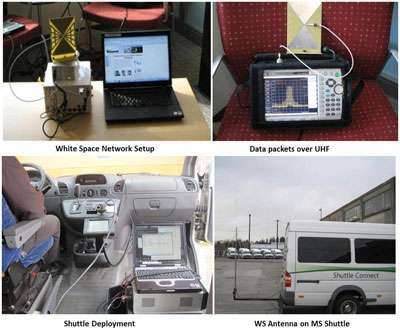 "WhiteFi achieved approximately four times the range of a 2.4 GHz Wi-Fi channel with the same transmission power and receiver sensitivity, thanks to less noise and better propagation through walls and obstructions," Chandra says, "so we were able to cover the entire Microsoft Redmond campus using just two experimental WhiteFi transmitters." Components of the WhiteFi network on the Microsoft campus. White-space devices (WSDs) need to know what spectrum is available at a location. One approach proposed in the WhiteFi paper was to use another chip to sense the spectrum. But because this adds cost to the WSD, Chandra and his colleagues worked on enhancements to WhiteFi that used a database as the primary means of determining white-spaces availability. "It's a scenario that reduces device costs," Chandra says, "because it means WSDs don't need to sense for available spectrum anymore. Instead, they can consult a geo-location database of incumbent spectrum users, such as television stations. The database dynamically manages information about the radio-frequency spectrum, which is a far more efficient and scalable model. WSDs can talk to the database, which would say, 'Since you're in Seattle, here are parts of the spectrum you can use.' The database manages dynamic allocation of white spaces. This is the new paradigm for dynamic spectrum access." The October 2009 campus deployment used the Microsoft Research version of the geo-location database, which was demonstrated for the FCC. In 2010, after rigorous review of the issues, the FCC ruled that devices could use a database to determine available white spaces. In 2011, the WhiteFi team published SenseLess: A Database-Driven White Spaces Network. It's the first paper that identifies and examines systems and networking challenges that arise from operating a white-spaces network that is solely dependent on a channel-occupancy database. The team also has announced that it would make the Microsoft White Spaces database, built for the pilot project, available to the research community. Chandra has worked with agencies in other countries, such as Singapore's Infocomm Development Authority, to adapt this database for use in Singapore's 2013 white-spaces trial. Campus WhiteFi and Xbox One wireless technology might seem completely different topics, but Chandra insists that the innovative wireless protocol he created for the Xbox One complements work from the KNOWS project. In 2011, the Xbox product team asked Chandra for help with a wireless protocol that could deliver both high throughput and guaranteed low latency. This was a challenging twist aimed at scenarios where the gaming device shares spectrum with other home Wi-Fi devices. Each of these devices contends for wireless bandwidth, resulting in collisions and retransmissions. This may be undetectable for some applications, but in gaming, every touch or action must be transmitted within a finite amount of time. A delayed response time degrades the user experience. "If you look at the wireless research community," Chandra says, "everyone is pushing to get more bandwidth and throughput. But what the Xbox One needed was a protocol that achieved predictable latency as well as throughput, so this was a first. "We began by taking on a limited version of the problem, something we felt we could solve. We worked with research interns Hang Yu from Rice University and Chunyi Peng from UCLA and designed a protocol that prioritizes gaming traffic in a way that gives it a higher chance of getting delivered within a specified period of time without affecting the experience of other devices in the home. We worked with several partners to implement the protocol and even set up testing in a realistic home environment. We expect to publish the paper on this work in 2014." When it comes to mobile networking, the Mobility and Networking Research Group takes a total systems approach—and that includes energy efficiency. Over the past three years, Chandra has been part of a virtual team working on different technologies that reduce the energy consumption of PCs and mobile phones. The group's work in energy efficiency demonstrates how even within the confines of such a specific research area, it's possible to explore a diversity of solutions. In End-to-End Energy Management of Mobile Devices—by Chandra, Omid Fatemieh of Microsoft, Parya Moinzadeh of the University of Illinois at Urbana-Champaign, and Chandramohan A. Thekkath and Yinglian Xie of Microsoft Research—the approach is to collect battery-consumption data from mobile devices, analyze them in the cloud to determine the likely culprit(s), and then limit the energy drain caused by these processes. The project, known as E-Loupe, provides fine-grained, on-demand control that ensures predictable energy drain without significantly compromising device functionality. 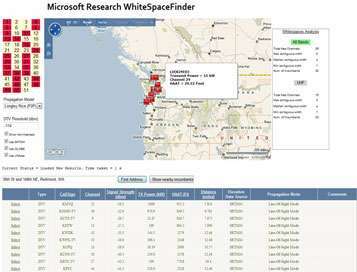 The Microsoft White Spaces database. Mobile applications have a huge impact on energy consumption. Unfortunately, it's challenging for app developers to measure the energy their apps use and to understand how energy use might change with conditions that vary outside of the developer's control, such as network congestion, choice of mobile operator, or user settings for screen brightness. WattsOn—developed out of work from the paper Empowering Developers to Estimate App Energy Consumption by Radhika Mittal of the Indian Institute of Technology Kharagpur, Aman Kansal of Microsoft Research, and Chandra—is an energy-emulation tool that enables developers to estimate the energy use for their mobile apps on their development workstation. This tool shipped with the Visual Studio 2013 release. Even storage devices have come under scrutiny. In February, Chandra will join Jing Li and Steven Swanson of the University of California, San Diego, Anirudh Badam of Microsoft Research, and Bruce Worthington and Qi Zhang of Microsoft in presenting On the Energy Overhead of Mobile Storage Systems during the 12th USENIX Conference on File and Storage Technologies. While most portable electronics use digital cards as storage devices, the storage systems are not configured to exploit their low-energy characteristics. In this paper, Chandra and his colleagues found that storage software stacks on these platforms sometimes consume as much as 20 times more energy than storage hardware. Their proposed model helps developers optimize the energy requirement of storage-intensive applications. "We need to examine all the factors that impact mobile connectivity, from battery chemistries to the applications," Chandra says. "It's an end-to-end problem." It's evident that the challenges of mobile networking keep Chandra busy and passionate about his work. "I get a lot of kicks from seeing 'my stuff' ship," Chandra says. "The thing about Microsoft Research is that you can impact many products. I've worked on wireless projects with people from Windows, Windows Phone, and Xbox. The product groups want to work with Microsoft Research. I feel I have an unparalleled opportunity to make a difference, not only in the academic community, but across the company." In fact, making a difference is one of Chandra's major life goals: There is a philanthropic motivation behind his research. He sees white spaces as a practical solution for providing Internet connectivity to poor and rural areas of the world. "The thing about white spaces is that you can cover long distances with UHF TV frequencies," he explains. "In places such as Africa and India, cellular carriers don't have the incentive to set up cellular towers for data networking in disadvantaged or rural areas because there aren't enough users to offset their deployment costs." In August 2013, as part of a white-spaces project sponsored by the Microsoft 4Afrika Initiative, Chandra visited Malawi, one of the world's poorest nations. The country's spectrum regulators invited him to give a tutorial on how to use TV spectrum to get more of the country connected. "We looked at two main scenarios: medicine and education," Chandra says. "How could we use technology to improve their situation? This is what keeps me passionate about life—and that includes research. "Whatever I do, I always go back and ask myself, 'How can I use this to make life better for poor people?' I grew up in India, and I've seen a lot of poverty. If I can somehow use technology to improve people's lives, that would make me very happy."